King's Lynn was anciently a very important port on the north Norfolk coast. The old name for the town was originally Lenn, later becoming Lynn Regis about the time of Henry VIII. The first maker of truly English clocks there was Thomas Tue, who made church clocks and lantern clocks. Some clocks are signed at 'Lynn Regis', but Thomas Tue signed his at Linn. There had been a clockmaker working there earlier, perhaps very briefly, named John 'Smyt' or Schmidt, and a single lantern clock in very ornate European style exists made by him and dated 1610, signed 'Jhone Smyt in Lynne wyt my hand'. Schmidt was clearly an immigrant maker, perhaps from Germany, probably just passing through. But that was before Thomas Tue was born, and Tue was the first to make clocks there that we recognise as typically English. We don't know anything about Thomas's origins. From his stated age at death we can calculate that he was born about 1613, and we know he was married in 1648 at Willingham in Cambridgeshire to Bridget Green. He was made free at King's Lynn in 1662 as a gunsmith at the age of about 49, and he seems to have regarded that as his principal trade although something like nine lantern clocks have been noted by him. But we know he worked there long before 1662. He dated some of his clocks and we know at least three of his clocks are dated well before that year (1646, 1649, 1655). A Thomas Tue was baptised at Berry Pomeroy in Devon on the13th March 1613/14, but this may be no more than co-incidence, though is a very unusual name. Could this Thomas Tue have sailed round the coast to King's Lynn? It seems unlikely. 1. Thomas Tue's 1663 clock in full with an alarm disc present. No maker's name is visible. We know from his earliest dated clock so far recorded (1646) that he was already working in King's Lynn when he was married in 1648. He was then 35 and she was 38. Efforts to trace his whereabouts before he was at King's Lynn in 1646, to determine how he came to marry at Willingham, and to trace the origins of Bridget Green (spinster or widow? ), have proved inconclusive. The ages and other evidence suggest it was his second marriage. Thomas's son, William, was also made free at King's Lynn, again as a gunsmith, in 1661/62, the same year as his father. Having traded there for over twenty years already without being a freeman, something must have prompted Thomas to take up his freedom. In view of his estimated year of birth he might well have been working there as early as 1634. Or he may have been elsewhere in his earlier years, following an apprenticeship and gaining experience. William must have been at least 21 at that time, which implies he was born about 1641 and therefore must have been a child of a previous marriage of Thomas. So we can deduce that Bridget was his second wife. Two other apprentices of Thomas's were freed in King's Lynn, also as gunsmiths, again suggesting that gunsmith work was his main occupation. They were Robert Roll in 1678/79 and Edmund Smith in 1689/90. The third clockworker to work in King's Lynn was John Geldarte (sometimes written Gildart or Gilder). He was a watchmaker, the son of a York goldsmith and a married man with children when he came from York, where he had worked since 1674, arriving at King's Lynn in 1685, then aged about 38 - at which time Thomas Tue was already 72 years old. We know Thomas Tue's son, William, was living in 1662, but we don't know when William died and it may be he was already dead by 1685, leaving a gap in Thomas's workforce. My feeling is that John Gilder came to King's Lynn to work for Thomas Tue, perhaps intending to follow him in business there one day. But John Gilder's working life there was brief, as he died only six years later in 1691, still described as a watchmaker and aged only 44. In 1691 Thomas Tue was one of those who signed the inventory of the goods left on the death of John Gilder. That inventory included several incomplete watches and watchmaking tools. But no watch or clockwork of any kind is known by John Gilder, nor are any watches known signed with the name of Thomas Tue. Was Gilder working for himself or Thomas Tue, or both? We don't know. The fact that Thomas Tue took on an apprentice (Edmund Smith) in 1690, when he was 77 years old, might be an indication that John Gilder was in failing health and Thomas needed a replacement workhand. Thomas Tue lived for a further twenty years. He died in November 1710 and was buried on the 1st December 1710 aged 97 at St. Margaret's church in King's Lynn. The text of a memorial, once in St. Margaret's church but now apparently lost, stated: 'Here resteth the bodies of Thomas Tue and Bridget his wife. He was twice Churchwarden of the Parish. He made and gave freely to the said Parish a new clock in 1681 and a clock at St. James and a Moon dial here at his own Cost and Charge. His wife died on the 26th March 1689 aged 79 years and he departed November 1710 aged 97 years and nine days'. He seems to have left no successors, having outlived his son, William. The presence of such a record in the church suggests he was not a Quaker, even though he seems to have had dealings with London clockmaker, Francis Stamper, who was a very ardent Quaker. Perhaps it was simply because Quakers had long achieved a reputation for honest trading. His clockmaking skills seem to have been limited to turret clocks, of which we know he made several - an article on the moon dial turret clock written by Ivan Slee appeared in Clocks Magazine for January 1995 - and lantern clocks, a few of which have been noted over the years bearing his name, some engraved with the dates of their making. Oddly enough no longcase clocks have been recorded by him, yet longcase clocks were flourishing even in the provinces by the 1690s especially during the last twenty years of more of his life. By then he was in his late seventies and perhaps he felt himself too old to learn new skills that late in life. 2. With the alarm disc removed the maker's signature is visible. What seem to be streak marks in the silvering are in fact score lines used to keep the numerals and half-hour markers on a true level. We know he made lantern clocks from at least the 1640s. Examples have been recorded bearing the dates: 1646, 1649, 1655, 1663, 1666, 1697, 1698. One is signed 'Thomas Tue at Lin 1646', another 'Thomas Tue at Lin fecit' 1655. Another is signed 'Tho. Tue de L'inn fecit 1663'. I have a note that in 1987 I saw a lantern clock signed in the dial centre 'Francis Stamper, London' and on the front fret 'Thomas Tue - Lynn', which might imply that he bought that clock from Stamper, a well-known Quaker clockmaker in London, to re-sell. Unfortunately I have no photograph of that clock, but we know Stamper was working from 1682 and died in 1699. Francis Stamper was from a prosperous background in Cumberland, was apprenticed at the unusually late age of 20 in the Clockmakers' Company to Quaker, Samuel Davis. He was connected with many influential Quakers here and in America including Daniel Quare and William Penn. If Thomas Tue was not himself a Quaker, I wonder why at the age of 70 or more he chose to do business with Stamper as opposed to other London clockmakers. Or was it simply that he re-sold a clock by Stamper, by adding his name to the fret? 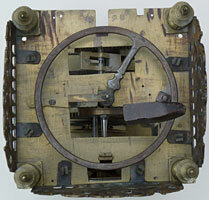 Or did maybe some past owner fit a Thomas Tue fret onto a Stamper clock for reasons we will never know? In his four-page will he described himself modestly as a gunsmith, 'sick & weak in body'. He signed it on the seventeenth of November 1710, and only just in time. He was buried at St. Margaret's church on the 1st December 1710. His will was proved just a week later on the 8th December. It is not very illuminating, except to point out that he owned several properties in King's Lynn and small plots of land here and there in the county. He seems to have left no children, or grandchildren. At 97 it is not surprising that Thomas had outlived virtually all his relatives. He left the house 'wherein I now dwell ... being in Kings Lynn aforesaid' to Thomas Tue, who was still under 21 and the son of his deceased nephew, Joseph Tue, a labourer - in other words his great nephew. His great nephew, Thomas junior, was buried there on the 17th April 1734. A deed of 1672 suggests that Thomas Tue and his wife Bridget took a property, being 'tenements in King's Lynn next grounds belonging to the Grammer School House in Baxter Row'. But by the time he died he owned several properties in Kings' Lynn, so this may not have been his main residence. Amongst them was the Bell Inn at Walpool. He left another property, 'wherein James Cowell now dwelleth' to his niece, widow Ann Daniell, for life and after her death that was to revert to Thomas Tue. His bequests included his silver tankard, silver spoons and other silver he referred to as his 'plate'. 3. The maker has signed in 'Tho: Tue de Linn Fecit decebr ye 5th 1663'. He has tried hard to keep his script level (with the help of the lateral lines?) but he was still far less at ease with freehand script than with patterns and numbers. The style of his clocks is extremely interesting. Those I have seen appear in some respects to be in the very distinctive style of London clocks - but only in certain respects. His earliest clocks seem to stay remarkably fixed in style. That style is based on London clocks of the1640s or even earlier and it is obvious he had knowledge of lantern clock styles of that period in London. His pillars, feet, finials are like those of London of the 1640s and my guess is he bought his castings there. 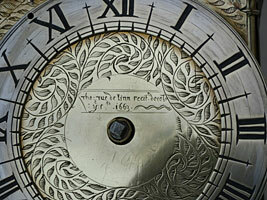 However his clock plates are wider than London plates of any period, measuring 6 and 3/8ths of an inch wide and deep. It follows that his dial is also larger than a London dial of the day, and, at six and a half inches. His chapter ring too is larger than that of any conventional lantern clock from London. Not many lantern clock makers anywhere used plates wider than six inches and London plates were almost always smaller than six inches. A very few other makers did use plates wider than six and a quarter inches. I can think of a few - Walter Archer of Stow on the Wold, Gloucestershire; John Disborough of Ashen in Essex; John Buck of Chester; William Reeve of Spalding, Lincolnshire; John Martin of Amesbury, Wiltshire; John Holloway of Stroud, Gloucestershire; Lawrence Debnam of Frome, Wiltshire; William Chittel of Studley (Warwickshire? ); William Cockey of Wincanton, Wiltshire. Almost all of them were individualistic makers working in the rural provinces in relative isolation and probably therefore doing a lot of their own work. Certainly we would expect them to have done more of their own work than many London makers who could buy in whatever parts they needed when they wished to. Apart from the expense and inconvenience of buying work from afar, rural clockmakers needed to be as self-sufficient as possible, in other words in total control. My view is that Thomas Tew made his own plates, dial sheets and chapter rings. 4. The movement has been re-converted back to balance wheel from a previous anchor conversion, at which time the alarm work would have been removed as being in the way. It still retains two independent trains for its two-weight drive. Note the undecorated hammer spring and stop. One further factor also implies that he made his own clocks, at least in his earlier period. If he was supplying others in the trade, as his sometimes-hidden signature implies, then he could not have been buying from London and hoping to sell on again to another in the trade. There just would not have been any profit margin left. The engraving style of his early dials is unique to him. His three earliest we have photographs of use the same chapter ring, a style based on one used by Peter Closon and a few other very early London makers - though Closon was so restlessly innovative he used many styles. The half-hour marker he uses has no name but it is a bit like a crucifix, though Closon and others sometimes improved this into three meeting arrowheads on a stalk. Tue's was very simple and, most importantly, very easy to engrave! Essentially just two crossed lines, just two strokes. It may not be absolutely unique to him, but I cannot recall seeing it on other clocks. Thomas Tue adopted a clever tactic in engraving his chapter rings, a tactic which may have been used by others, but if so they were skilful enough and experienced enough to conceal it. All engravers used marking-out lines, principally to help keep lettering level. These were usually quite faint lines, which they then polished away later so that they did not show in the finished work. Thomas Tue scribed marking-out circles around his chapter rings. Obviously he scribed and engraved two circles around the inside, against which he marked off hours, half hours, and quarters, then two lines around the outer edge for neatness - virtually all lantern clockmakers did that. But he also scribed circles to mark the positioning of the tops and bases of the Roman hour numerals and also to mark the junction points of his crucifix half hour markers. This was to make sure everything lined up neatly and consistently, which was probably regular practice for all engravers. But he should have polished out these marking-out circles, whereas in fact they can still be seen, perhaps because he scribed them too deeply to polish out. They can be seen on the 1655 and 1663 clocks. I cannot recall ever having seen such scribe lines on a London clock, as professional engravers would have learned not to leave them showing. This seems to me to be evidence that, at that time anyway, he was doing his own engraving. I recall that John Sanderson of Wigton is notorious for having left his marking-out lines showing. 5. The top plate shows the re-instated balance wheel control, the brass balance wheel very neatly made. Thomas Tue's corner engravings are a stem with leaves, a garland. Some London makers did a vaguely similar thing, which is probably where he got the idea. But when it comes to the dial centres he completely fills them with the same kind of entwined branches of leaves, which are in effect a proliferation of his corners. Very eye-catching, very distinctive, very handsome, but most important - relatively easy to engrave. If you can do one leaf, you can do a hundred! Engrave the leaf outlines, then hatch each one with crosslines. It may be time-consuming but not difficult for someone with any engraving skill at all. This dial centre pattern is unique to Thomas Tue, though other engravers incorporated leafy branches into their work amongst such features as flower heads. The arrangement of the leafy branches in his dial centres varies slightly between his clocks, but once you have seen it, you cannot mistake it. Leafy branches are seen on London clock dials (e.g. some by Peter Closon), but in London these branches mingled amongst other decoration, not filling the entire dial centre in the way Thomas Tue did. London makers did not use Thomas Tue's unique dial centre design. I mentioned before that his earlier clocks seem static in style. For instance the one dated 1646 looks very similar to the ones dated 1655 and 1663. Almost twenty years have passed yet his style remains the same - the same leafy branches with the same crucifix half hour markers, the same Civil War period finials. When we realise that he had mastered his own engraving, that probably explains things. Once he had developed his own technique, he saw no reason to change it and he used this pattern at least into his 50s, maybe for much longer. One of his later clocks is now at Moseley Old Hall, a National Trust property in Staffordshire. It can be seen by its left-hand hammer to have been a pendulum clock, almost certainly a verge pendulum, which means it must date after about 1670, and probably was made in the 1680s. It is clearly by its style a London clock .... such features as the general frame, the chapter ring half hour makers, the dial centre style of flowers including tulips emanating from an open central flower head above VI, the leaf corners - all are London features, none of which are on Tue's earlier clocks. This suggests Thomas Tue bought his later clocks from London, as the one bearing Francis Stamper's name seems to testify. And the Moseley Old Hall clock was made with a verge pendulum not with a balance wheel, which his earlier ones had. Of course, a verge pendulum was standard practice in London by the 1680s, when the balance wheel was obsolete as a timekeeper. I had just about finished writing this article when I heard out of the blue from a man named Tony Weston, who is deeply involved in research for a book entitled: 'ENGLISH SPIT ROASTING JACKS' 'Their Development and Evolution from the 17th to the 19th Centuries'. By one of those strange co-incidences that seem to crop up in the world of horological research, he told me that amongst the makers of those he has recorded is the name of Thomas Tue of King's Lynn. In fact he told me considerable detail, but for that - you'll just have to wait till his book is published.